The luxury service you need at the prices you want. Are you in the market for luxury transportation in North Carolina? Do you want to find the most lavish vehicles paired with the most reliable services? Are you on a tight budget? If you've answered yes to one or more of these questions, then you're in the right place! If you're in need of something that can transfer 18 people or you're in need of something that can transfer 40 people, we've got a gorgeous bus for you. We have the finest fleet, the most affordable prices, and a great team of people. Most importantly, however, we pride ourselves on providing high quality customer service which goes above and beyond the expectations of our customers. If you're planning a surprise birthday party for a loved one and need us to show up at a specific time, we'll be there on time. If you need a spacious vehicle to accommodate your entire wedding party or your guests to and from your reception, we can make it happen. If you need transportation to pick up an executive committee from the airport, we can do that as well. As long as you're happy, we're happy and we'll stand by that until the day we stop doing what we do. Our buses are the most loved in the region and there's good reason why. We offer high quality interiors and the best amenities in each and every one of our vehicles because our customers deserve it. Within seconds of stepping onto our party buses you'll understand why we're NC's most loved luxury transportation company! From the exterior, our buses look unassuming, with dark windows for privacy. But inside is a party! Leather seating upholstery, hardwood floors, dance poles, club-like color-changing lights, and spacious coolers to chill your drinks! You'll also find large HDTVs built right in and there's DVD players as well. The stereos are incredible and of course there's CD players and input for your phones, iPods, or other digital media players. With such a wide array of features, you can celebrate absolutely anything! Whatever the mood of your celebration, be it calm and quaint, or wild and crazy, our vehicles have the features to set your atmosphere. Play a movie or enjoy a calming screen saver and sip wine or champagne. Pump up the music and knock back a few beers or mix up some cocktails and dance the night away! There's plenty of space to do whatever. There may not be any day as important as your wedding day! When it comes to the transportation, don't settle for less than the best! Whether you're planning an intimate ceremony, an extravagant affair, or just eloping, we have a suitable limo for you! Whether it's a local band or a national act, you're sure to want to head to the show of your favorite musician with your friends. But big shows can cause big traffic, and that's never fun. Bypass all the stress and hit the road in a luxury vehicle from our fleet! 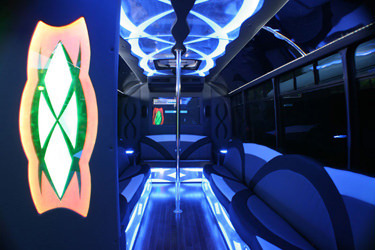 No matter what age you're celebrating, a luxury bus or limousine will kick your party into high gear! Let us take you to your favorite places around the city, or out to try a new restaurant, or enjoy live entertainment! It's the best way to celebrate a birthday! There's great watering holes around the city. From sports bars to dive bars to swanky cocktail lounges, there's a place you'll want make your regular spot! Explore them all this weekend with friends and let us be your most luxurious designated driver ever! Are you hosting a corporate conference or convention? Do you need an impressive mode of transportation to take your colleagues to and from the airport, hotel, and venue? Look no further! We have a great selection of vehicles for corporate shuttles. Can't pick one thing to do between bars, museums, and the arts? No worries, just hit the town and explore it all! We'll take you to each and every destination in style! Call us now to learn more and get a quote on a luxury vehicle to explore all Raleigh offers.